For those who’ve visited Apple’s iTunes Movie Trailers site in the past couple days, you may have noticed that Apple has removed the download links on newly posted trailers. There’s been many conjectures as to why Apple decided to remove the download links. Some believe the movie studios are pressuring Apple into doing so. How else will they be able to track user views if people are allowed to download them? Others believe Apple is conserving resources. Given the small amount of trailers we do host, resulting in multiple-digits worth of TB in bandwidth consumed per month, one can imagine how much bandwidth they’re going through, for pretty much a free service that’s was created to advertise their QuickTime player. I personally think it’s much more simpler than that. Apple’s philosophy is simplicity. Users don’t want to be bombarded by options. It clutters the screen. Users want to click Watch Now and get the best quality for their screen size and bandwidth. They’re already testing that with the Automatic option, but their current platform doesn’t allow the video quality to dynamically change mid-stream. Is dynamic video streaming something they’re working on and will they be presenting it shortly at WWDC? *shrug* There’s really 2 major protocols in today’s video streaming technology: Flash and RTSP. RTSP already supports streaming H.264 and is what Yahoo! uses mainly for their video playback now. Update 2013/06/02: infiniter has brought to my attention that if you load the Apple trailer pages using the iPad user-agent, it still provides you with a Watch HD that directly links to the 720p file. For more information on how to switch user-agents, please see our previous post. Anyway, you probably didn’t come here to find out why Apple removed the download links, but how to get them back. Unfortunately, it’s not very straight forward. I’ll be using Pacific Rim for my example if you want to follow along. You’re probably wondering what are these large.html and extralarge.html files and why do they keep taking you back to the main trailer page? The trick is to open those pages NOT in a browser. Your browser’s source viewer (e.g. Pacific Rim’s large.html) would be able to open them. Once again, open it in your source viewer. For 720p, do the same thing, but with the extralarge.html file. BONUS: Although Apple no longer links directly to the 1080p encodes anywhere on their site, the 1080p encodes are still available if you just tinker with the 480p/720p URLs and replace it with 1080p. No guarantees if this will last though. 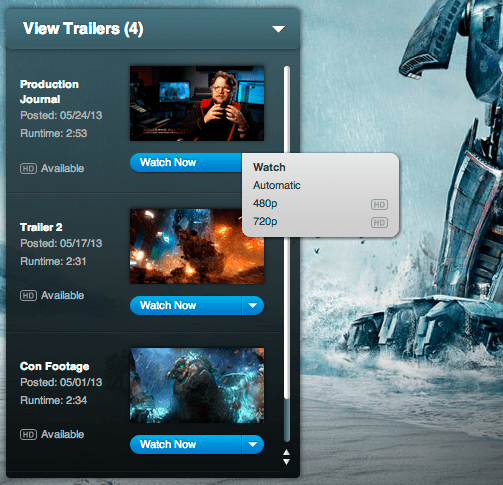 Or if you’re too lazy to do this, that’s why HD-Trailers.net exists! Enjoy! Feedback and comments are always appreciated. This entry was posted in Development and tagged 1080p, 480p, 720p, apple, download links, iTunes by Krunk. Bookmark the permalink. Trying to view the newest Man of Steel trailer and the page isn’t set up to include the source you claim is there. Then open any of those in your source viewer and you’ll find the mov link. Right before Apple went apshit over this, they had an official iPhone version of the Man of Steel Trailer 3. I’ve been trying to find that one but haven’t had any luck (I tried iphone.html, ipad.html, ios.html, iPhone.html, iPad.html, and iOS.html). Would any of you be able to dig this up for me? I’d really appreciate it. Yeah, I know I could just re-encode one of the HD files, but I’m trying to get this one specifically. I’m sorry to make you hold my hand, but what am I doing wrong here? Try opening it in Chrome/Safari or set your user agent to QuickTime. Thank you kindly, Krunk. I got it worked out! 1. Open developer tools (F12). In the lower right corner click on the gear icon. 2. In the popup window go to overrides and set user agent to “iPad – iOS 5”. 3. Reload the page – it will look slightly different, just like on an iPad. There will a separate button like “Watch HD” with directly connects to the trailer file’s URL. 4. Right-click the “Watch HD” button and select “Save as…” to directly download the HD trailer to harddrive. I can’t find “save as”. AAAAND…..unsubscribed from Apple trailers and subscribed to HD-Trailers.net. Much obliged Dear Sirs! What I’m looking for is a way to find out the embed code for a trailer on Apple.com trailer pages. I’ve seen some sites that have embed codes for new trailers, but I can’t find out how they got it. Apple doesn’t provide embed code to share trailers. They’re usually manually crafted, but as long as you have the video url, crafting the embed code should be straight forward. I know how to embed the direct url of the trailer, but then you don’t get some visible controllers, depending on the size of your window. I found this embed url for the new 47 ronin trailer on a site. But I haven’t got any luck to find out where they managed to find the embed url, because if you change the url to the direct link to the trailer http://movietrailers.apple.com/movies/universal/47ronin/47ronin-tlr1_480p.mov, then it just become like I wrote first. I have tried to just change the movies name in the embed url, hoping they would use similar permalink for all movie trailers, but it seems that isn’t the case. I’m not sure I understand what you’re looking for… Are you asking how to use a custom video player instead of default QuickTime player? What Apple does there is just hide all the controls on QuickTime and load web graphics that interact with the player. It is not an embed script. It’s basically designing a video player in HTML that’ll interact with the embedded video player which has all its controls hidden. No, I’m not looking for any custom player. I’m looking for someone who knows to find the embeded url from the apple trailer site, as I’ve seen some sites seem to know how, like the above url. Because the embeded url I posted above are from Apple, but they seem to hide it very well. But some people seem to know how to find it somehow. It may be so, but I still think they would have this feature for all their trailers and I can’t find out how to get hold of the url for it. It can’t just be for 47 Ronin, but if so, I still can’t find out how the other sites managed to know the url for that. This is just using Chrome’s source viewer. Firefox has a similar tool that’s built into its browser. Thanks to this Post i can DL the Apple Trailers once more 🙂 But all the above methods are to time-consuming if u like to watch and store many trailers in Linux. So i have build a BASH script for me that automates as much as possible. And because this Post was my inspiration i would give something back 😉 So here it is. Not being able to play in VLC is pretty weird… Have you tried updating to the latest version? For all I know, Apple’s trailers are encoded in H.264 + AAC. jup it is weird, my applications are all updated. after you’ve found the movie link, you have to right click –> save link as right? This version will also give you the list of download links: Right-click on one of the format headers (480p, 720p or 1080p) and the list is added to the clipboard (requires Scriptish).